We regularly conduct tours, talks and other events that will delight, educate and entertain you. Most of the activities we offer you incorporate a tasting experience that includes both wine and food - primarily that which is carefully grown organically here at Oranje Tractor Farm. See below for the links to the options we currently have available for you. If you're looking specifically for an Oranje Tractor wine tasting only, check out our wine tasting page for details. Tours are conducted every Saturday if there are bookings, which can be made up to 24 hours before the tour by clicking the BOOK ON-LINE button here or on the name of each tour below. We are also happy to conduct them on demand (on days other than Sunday and with a minimum of 6 people with 24 hours notice). Please contact us by phone or email to discuss the "on-demand" option. Experience a guided tour through our edible landscapes including the potager garden and orchards, featuring more than 30 varieties of fruit trees, where you will smell, pick, taste and take away organically grown produce. Get a glimpse of what HRH Prince Charles and Camilla enjoyed during their visit to Oranje Tractor in November 2015. Tour commences @ 11am. Cost $45 per person. Minimum number of persons is 2. Stay on after your Food Forest Forage for a Wine Flight ....5 of our sensational wines paired with 5 samples of seasonal produce from the Amazing South Coast region. Tour commences at 11am. Cost $68 per person. Minimum number of persons is 2. Experience a Wine Flight then, enjoy our Ploughman's Lunch which includes a selection of produce from our farm-tree ripened fruit, olives, nuts, salad greens, freshly baked bread, local cheeses, free-range chicken or smoked trout and other seasonal produce from the region. Includes a complimentary glass of wine. Flight commences at 12.30pm. Cost $60 per person (additional wine can be purchased by glass or bottle). Minimum number of persons is 2. Then, enjoy a Wine Flight where you sample 5 of our wines matched with local cheeses and and other tasty morsels from the region. 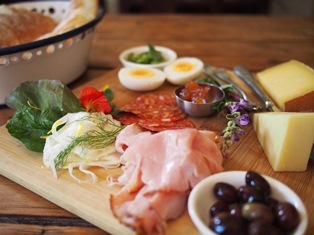 To finish, savour our Ploughman's Lunch which includes a selection of produce from our farm-tree ripened fruit, olives, nuts, salad greens and other seasonal produce from the region including freshly baked bread, local cheeses, free range chicken or smoked trout. Includes a complimentary glass of wine. Your day will start @ 11am and conclude around 2.30pm. Cost $95 per person (additional wine can be purchased by glass or bottle). Minimum number of persons is 2. The following tours can be arranged "on-demand" providing minimum participant numbers are met. They are also offered sporadically throughout the year. Please check here for current offerings. Join us for an afternoon of fabulousness...learn more about the traditional method of making Champagne and prestige sparkling wines from Vin de Champagne Award Winner 2004 (Pamela Lincoln) and get your hands wet with Murray Gomm as he helps you disgorge some Oranje Tractor sparkling wine. Stay for lunch and enjoy a glass of bubbles or take home your own twin-pack of sparkling wine that you can proudly say you had a role in making. $225 per person. Minimum group size 6, maximum 12 persons.